When you sit down to review all of the photos and video footage that you've taken throughout a friends life, it's surprising to realize how little you've really captured. There were so many moments and events that it didn't even cross our minds to pick up a camera. The irony is that as film students we didn't shoot near as much of one another as we should have. I was keen to edit something with all of the footage I had of Dave from our Indio road trips, and thankfully Tyler was interested in collaborating to help me pull something together. Tyler deserves a lot of credit for finding his footage of Dave and a bunch of his photographs and overnighting them to me so I could edit something. The project wouldn't be near as rich without his contributions. Thanks, buddy! Of course, the task of editing something under these circumstances wasn't easy. My goal was just to capture the essence of who Dave was. To show him happy. To give him a send off that would make him proud. And, I think he would be proud to see just how much we cared about him, and how much we still care. R.E.M. was his favorite band so I wanted to include Losing My Religion in the edit. Knowing that Dave and Wendy weren't religious people, but that there were those around them that were, I tried to create a balance. I cut Losing My Religion to contrast with scenes of us at Salvation Mountain, a place adorned with Biblical quotes and messages. I then ended the edit with a song by The Killers which has a closing lyric stating 'it seems like heaven ain't far away'. I'm also not a religious guy, but I can understand and respect it. If there was ever a time you wanted to believe, it would be times like this. Today is the day of Dave's funeral. It's going to be difficult, but I know being around friends will help. This is for you, Dave. "Thank you Luc" just doesn't cut it. But thanks anyway. You are an amazing man and the world is a better place with you in it. 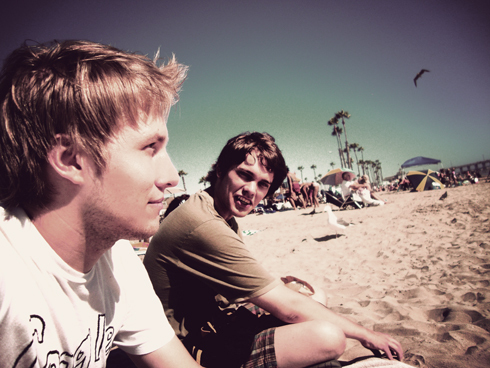 Dave was so lucky to have friends like you & Tyler. I am speechless - this video is the most heartfelt, honest, gracious tribute I have ever seen. I hope your grief becomes bearable.